8a-5p M-F - 9a-2p Sat. We are located at the corner of I-70 & Cave Springs in St. Charles, MO, 25 minutes West of St. Louis. Looking for GIANT screens? Stop in to EPC, Inc today! 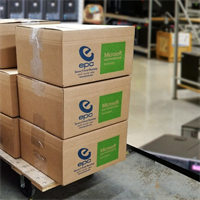 With great technology deals both in their 5500sqft Retail Showroom in st. Charles, and a complete online store and online auction presence, you can get what you want, right now, from EPC, Inc! You've driven by our building thousands of times, but - have you stopped in to see what we can offer you? Whether it's for your home or business, EPC is your one-stop technology shop. We look forward to seeing you! Where are our DDRVs (Data Destruction Recycling Vehicles)? They're in a town near you and destroying more data daily! Ready to have your data destroyed by a trusted, certified, experienced company that's been in business since 1984? Contact us today!